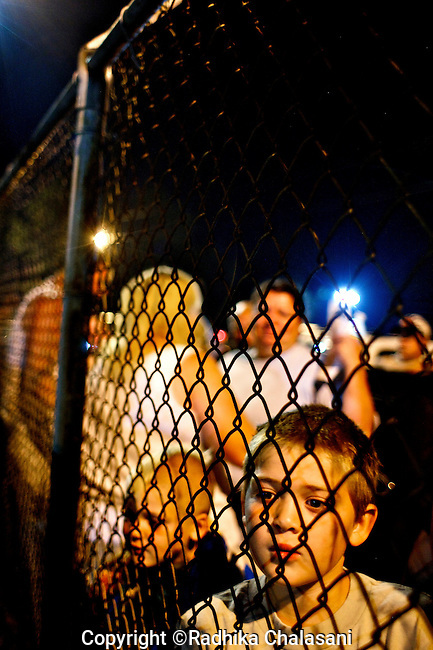 WISE, VIRGINIA-JULY 25: Matthew Harden (8) and his brother Mason from Dryden, Virginia wait with their family in the early hours of the morning to enter the Virginia-Kentucky Fairground for free medical care from the Remote Area Medical (RAM) Expedition in the heart of the Appalachian Mountains when the gates open at dawn. Many slept overnight in their cars, trucks, RVS or in tents. The two and half-day event helped provide health care for 2,715 people, uninsured or underinsured with unaffordable co-pays or high deductibles for their insurance policies. An army of Seventeen hundred volunteers including individual doctors, nurses, members of the UVa medical and nursing schools, and the Lions Club helped organized the event and provide services. Organizers estimate that they provided over $1.6 million USD worth of care.